Polyester pull-on skirt with half inch elastic waistband. 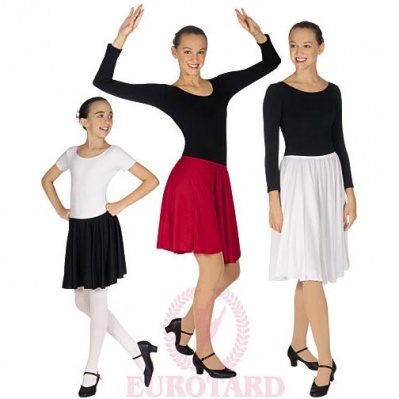 Versatile item that can be used for character dance, ballroom, theatrical, lyrical, and more! Length can be cut to length without the need to hem, offering the perfect fit for adults and chidren. Small - Fits waist sizes of 20" to 32"; measures 18" in Length. Medium - Fits waist sizes of 21" to 34"; measures 24" in Length. Large - Fits waist sizes of 22" to 40"; measures 28" in Length.